I'd like to know what technologies you would all like to see the Enclave develop. It could be anything really, so long as it's plausible in the Fallout world (that narrows it down a whole lot[/sarcasm]) and you can actually see the Enclave having a real use for it. Oh, and descriptions are always a plus. Yeah....I kinda knew this thread would fail, but....whatever. EMP for robots the brotherhod has. some type of APC and MBT to solidify our ground presence and truly secure our superiority. the APC would need to be able to carry atleast 8 soldiers in power armor. it would also need some anti-personnel weaponry a gatling laser type turret weapon would suffice. the MBT would need to be as fast as the APC and be able to traverse most terrain without too much trouble. the MBT would need a powerful main cannon that fires HE shells sacrificing penetration for explosive power. this is mainly to level bigger settlements that resist our dominance. Something to kill robots that doesnt cost 22 million dollars a missile. Well I do have this screw driver, just climb up the beasts back and jab it in his neuro processor. Nah, that's what I designed my plan for. Just do it. HERES A PLAN, LETS TRY TO ROUND UP SOME OF THE DESERTERS AND BRING THEM BACK TO THIS SITE. ITS STARTING TO GET A BIT BORING W/O PISTOLERO OR ANYBODY EXCEPT PEBBLE AND THE OCCASIONAL COMMENT BY FLAT TOE. he watch who you are calling a deserter. if you actually said something that needed a response (like this) i'd post more often. Well, in all fairness you started showing up about a week ago. And im pretty sure there are posts you could respond too, but ill not go there. The point is this site is incredibly inactive. Do you not argue that? well i can't really argue with that because it's a fact this site is rather inactive. as for responding in other threads, i have posted in a couple of threads, where i felt i could actually add to the conversation, i generally don't post just to show people i'm still alive, also i'm not going to respond to something which was on page 2 of a thread if the thread is now on it's 5th page. as a side note i'm personally kind of picky about what i respond to, i have this arbitrary set of rules for myself that i keep to. it's all rather silly but that's just the way i work. same with how i only play male characters, or i like limit myself in the actions i take in-game (mostly speech wise) because i think it's wrong to do something. for instance i keep having a hard time picking the more "rude" remarks in games while i have no such restraints when it comes to killing the people i was so polite to just 5 seconds earlier. yes i'm a little weird that way. Also, please realize my post was not meant to be insulting in any way, just bringing attention to the fact if it wasnt there already. i know, i can sound a little defensive from time to time, should really remember to use more smilies. anyway no offense of any kind was taken. Anyhoo, which of you actually think we, simple earthlings, could crack that brilliant alien technology? All those blinking lights will surely give any of our engineers a seizure; just as the aliens had planned. Oh and Daredhnu, I'm the same way in games; I can't stand being a jerk to someone while talking, but don't mind at all shooting them. I'd like to think they left this world knowing I was at least polite. hehehe reminds me of the "meet the sniper" video for TF2. "have standards.....be polite.....be efficient.....have a plan to kill everyone you meet." we send in our brightest, and wait for it ..... youngest, kids seem to immune to such mind boggling things as bright blinking lights so naturally they will be of utmost importance when figuring out the aliens technology. By the way, I found this nice pic on DA a while ago and then saw it again today. Someone mentioned it would look great in NV, and I have to say, I agree. 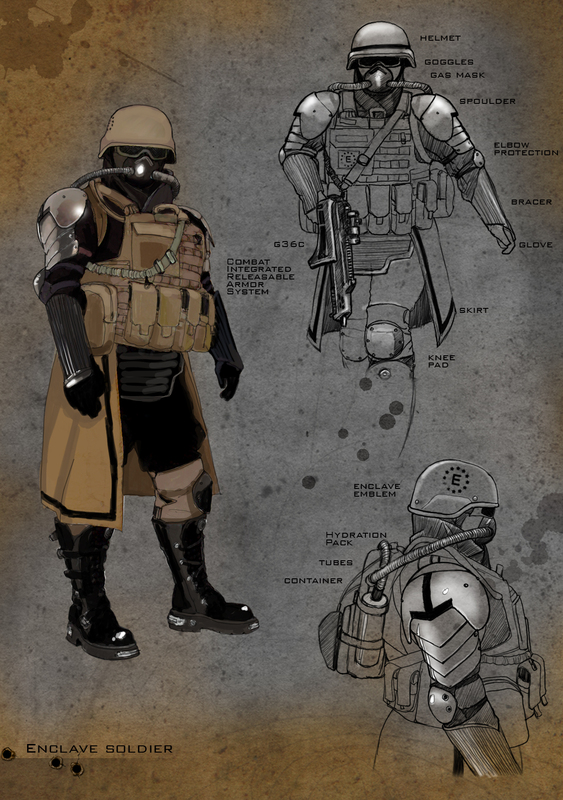 If it was actually used by the Enclave, then this would definitely be their badass version of desert combat armor. that does look sufficiently enclavey, pretty menacing so it would definately work for enclave combat armor.